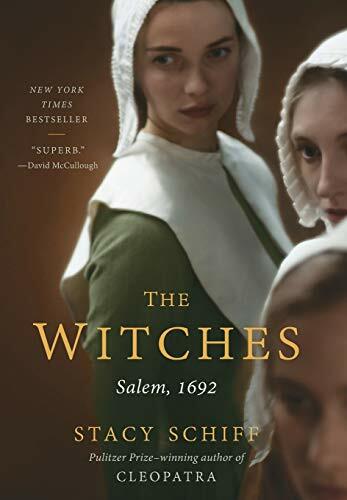 In her book The Witches: Salem 1692, author Stacy Schiff gives a clear definition to “witch hunt.” Call it what you will—hysteria, superstition, fear, greed, or a demand for attention—Schiff tells it like it was: a witch hunt! Her excellent, detailed research, much from original files and transcripts of the trials, takes the reader right into the accusatory scenes; experiencing the terror of both the accuser and the accused. She designs a macramé of blurred responsibilities that even the best artist could not untie. With these words Schiff sets the stage for witches and brooms and things that go bump in the night. At least in the imagination of the terrified and superstitious residents of the Massachusetts Colony, this was a true picture. One of the major players, Samuel Parris, was the local minister to his flock when his daughter and niece were two of the primary accusers. It should be noted that much of the information that comes down through the centuries to discuss this event is here as a result of Parris’ writings, having been identified as the scribe of the initial interrogations. The characters are many and varied, from ministers to government inquisitors to parents and children—black, white, and every stripe in between. Many things become clear as the book progresses, but not the least of which is that inquisitors John Hathorne and Jonathan Corwin both looked for reasons to find guilt. It is apparent from the start that superstition ruled the Massachusetts Colony in 1692. Everyone at all levels believed in witchcraft, from the illiterate to the highly educated. It was more dangerous to not believe in the existence of witches than to believe in them. The town of Salem and its surrounding area was not one of pleasant neighbors. Everyone fought and frequently brought their contentiousness into court or church, where one would expect the Puritan mindset to be forgiving. Not hardly. The town setting was ripe for gossip and accusations and they began with (mostly) young women picking out their targets and being unrelenting in their accusations. With the mindset being what it was, the Parris’ Slave, Tituba, soon took center stage with exaggerations and colorful descriptions that held the town in a death grip. The larger her stories, the tighter her grasp, and the more the town believed. Witchcraft at this time was directed more at women than men, but that did not mean that men were not charged. In her chapter “The Wizard,” Schiff went into great detail about George Burroughs. Reading about this man, three-plus centuries after the fact, raises ones curiosity about whom, exactly, could be accused. He is painted in many cases as somewhat of a hero—a man who fought indians, lost wives, preached to the needy, and yet there he was, facing a carefully crafted case by Hathorne and Corwin based on accuser’s questionable accounts. As the testimonials proceeded, the afflicted fell to the ground writhing and screaming, and in spite of the good things attributed to him, “All evidence pointed to the same conclusion: he was a bad man but a very good wizard.” And yet Burroughs was not the only “wizard” to fall prey to the inquisitors. Old men, young boys, town leaders, farmers, and ministers each felt the sting as a finger was pointed in their direction. As complaints from incapacitated children grew, so did the charges, and the number of accused literally clapped in irons. In “A Suburb from Hell” Schiff introduces the newly arrived governor, William Phips, without whose direction the trials could not legally move forward. But arrests could! “By the end of May at least sixty suspects had been jailed, more than the Massachusetts prisons had ever accommodated.” The accused were shackled in the town jail (a suburb from hell), a building described as freezing in the winter, stifling in the spring. Upon his arrival, Phips established the “Court of Oyer and Terminator” to hear and determine guilt. Attorney Thomas Newton was assigned as attorney to the court, and although with a vast selection of witches in front of him, he chose Bridget Bishop as his first defendant. As Court Clerk, Stephen Sewall transcribed the events as scrupulously as Parris had before him. Schiff’s description of the Court of Oyer and Terminer is steeped in as much detail as available from these transriptions. Of the five justices who presided over Bishop’s trial, the names of three have come down to us today while two remain anonymous. One justice, Nathaniel Saltonstall, dissatisfied with the court proceedings, resigned his position on the court after the trial and execution of Bridget Bishop. As trials continued, so did new arrests. It is inconceivable that some of those accused were ever touched by such complaints; there seems to be no why or wherefore to identify how they came under attack. And yet the superstitions of the time ran rampant over common sense. Children and young women, for the most part, held the town of Salem in their clutches. A response to his concerns is not noted. And in addition to Salem, other communities succumbed to this plague; Andover experiencing a rapid spread of accusations where family members charged other family members. Schiff also describes an earlier incident in Sweden that resulted in witch burnings. Her descriptions of the deaths of the accused carry with them the great weight of the events—even over three centuries later. The hanging of George Burroughs, the only Harvard graduate to meet such a death; Giles Corey, the only individual with the distinction of being pressed to death instead of hanged. On September 22, 1692, the final hangings occurred with seven women and one man going to their deaths. “All were convicted for having tortured the Salem village girls, of whom some had never heard, and upon whom most had never before set eyes.” Within a short time after these hangings, however, the court began to experience increased criticism. Confusion ensued with the justices unsure of how to move forward. What makes The Witches so fascinating is the extreme depths from which Schiff pulls her detailed descriptions of individuals, places, and events. Two of the major players in this revelation were Increase and Cotton Mather, father and son, at odds with each other regarding witchcraft. Schiff gives great attention to both men and their positions on the issue of witchcraft, especially the roles each played during the trials and in the aftermath through their writings and speeches. To be fully appreciated, this is a book that must be consumed, event-by-event, character-by-character, and location-by-location. It is not a quick read, but Schiff’s attention to detail brings everything about this time in American history bubbling to the top, to be relished and reread.